Niklas Backstrom, Josh Harding and Darcy Kuemper probably won’t decide who starts, who is on the bench and who is in the press box in Thursday night’s Game 5 against the Chicago Blackhawks by racing for empty chairs. The reality is perhaps more concerning. It may simply be decided by whoever is physically able to play for 60 minutes or more between the pipes against one of the NHL’s best offenses. Mike Yeo’s wasn’t giving any clues about who is starter or back-up was likely to be. Perhaps he was worried that doing so would be just one more jinx in a series where goaltending misfortune has been the story-line for the Minnesota Wild. It started about as early as it possibly could have started. Niklas Backstrom, the team’s #1 goaltender over the past seven seasons, suffered an injury during the pre-game warm-ups ahead of Game 1. Few people had given the Wild much chance in the lead up to the series, and any chance that they had given them rested on the shoulders of their veteran goaltender. 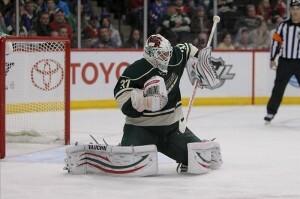 Most Minnesota fans would have had their doubts when they saw Josh Harding take to the crease for the start of Game 1. Harding had missed most of the regular season while dealing with symptoms from new medication for multiple sclerosis. Harding was diagnosed with MS last October and had shown tremendous resolve and determination to continue his NHL career in the face of the adversity of that condition. [See also: Josh Harding, Jordan Sigalet and Multiple Sclerosis]. Harding’s health problems meant that he had only played 60 minutes in total (across two relief appearances) since the end of January. His last start before Game 1 had come against Chicago on January 30 when he was pulled 6:45 in after allowing two goals on four shots. Harding quickly banished any concerns about his ability to perform. The 28-year old was a consistent bright spot during an up and down first three games for the Wild. He was steady and made some important saves as Minnesota battled against a high-powered Blackhawks attack that includes the likes Jonathan Toews, Patrick Kane and Marian Hossa. He posted a .928 save percentage and 2.67 GAA through the first three games and was playing well enough to warrant his place in net even if Backstrom became available again. However, in the last minute of Game 4 after stopping five of six shots through 19:51 minutes of ice time. Harding appeared to suffer some sort of lower body injury and had to leave the game. Rookie reserve Darcy Kuemper had to step into the breach playing the last two periods allowing two goals on 18 shots. Kuemper made his NHL debut during the 2013 season. He appeared in six games posting 1-2-0 record, a .916 save percentage and 2.08 GAA. The 23-year old has also dominated the AHL while playing with the Houston Aeros this season. He has shown off tremendous talent and has impressed many with his calm and poised approach to the position. Still being thrown behind an inexperienced blue line facing this Chicago team at the United Center is no easy task for a rookie. If he does turn to Kuemper, then Yeo will hope that he steps up the task just as Harding did in Game 1. It might just be the best chance that the Wild have of prolonging this series. Backstrom’s appearance on the bench at the end of Game 4 has led to some speculation about his possible availability for tonight’s game. Yeo might just be tempted to roll the dice on his veteran’s health and ability to find his game immediately. 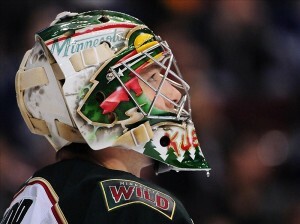 However, maybe Minnesota are just better off embracing this enforced game of musical goaltenders. It certainly won’t damage Kuemper’s development to get a taste of an NHL playoff start. It seems that fans will have to wait to find out the identity of the player charged with the huge task of leading a Wild upset in Game 5.